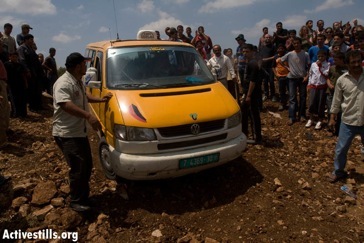 On Saturday 10th May, approximately 200 Israeli, Palestinian and international activists converged on the village of Shufa, seven kilometres south-east of Tulkarem in the north-west of the West Bank, to remove the Israeli-imposed roadblocks that deny the residents of the village freedom of movement. Organised by the municipality of Shufa, Combatants for Peace, Tulkarem Centre for Social Services, the ISM and Anarchists Against the Wall, the demonstration was part of the Nakba commemorations that are taking place throughout the West Bank from 8th-15th May. 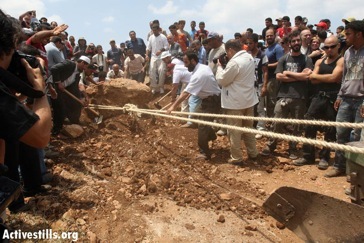 At 12pm approximately half of the activists, including village residents, carried picks, shovels and hoes to the one of the four roadblocks that cuts Shufa from nearby Izbit Shufa – which force residents to travel the one kilometre distance either by foot, or to take a 2 hour car journey. 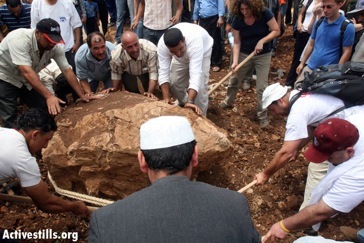 The successful removal of the roadblock took approximately two hours, with demonstrators having to resort to using a village tractor to move some of the larger rocks. Finally, a service mini-bus was able to cross through the remnants of the roadblock, to the cheering of the waiting crowd. 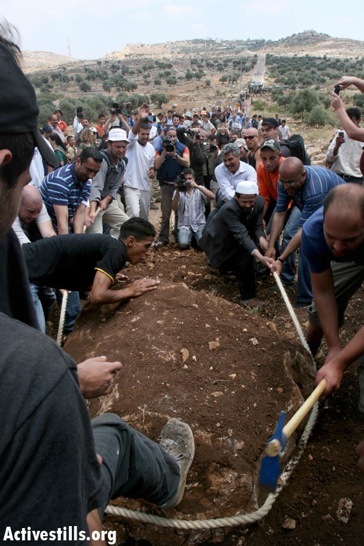 Throughout this process, approximately 30 Israeli soldiers waited behind the final roadblock – 50 metres away, to ensure that the road would not be cleared entirely. When activists attempted to make their way to the final roadblock, soldiers quickly intercepted them, blocking their way and insisting that they not take photos. When activists attempted to push through the line of soldiers, sound bombs were thrown into their midst, followed by a barrage of rubber-coated steel bullets, shot at close range. 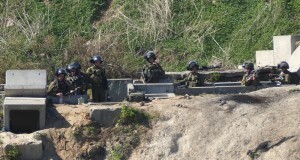 Soldiers continued to fire at the activists whilst they were fleeing. 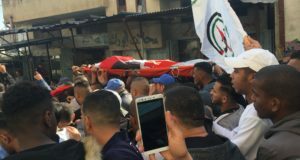 Four Palestinians, four Israelis and one international were injured by the assault, one of whom required hospitalisation. Four of the injured were sitting immobilised in the fields, receiving first aid treatment, when approximately ten soldiers approached the group. 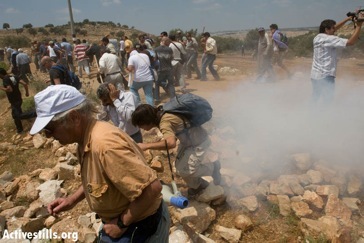 After a brief exchange of words, Israeli soldiers threw sound bombs at the group, despite their obvious incapacitation. 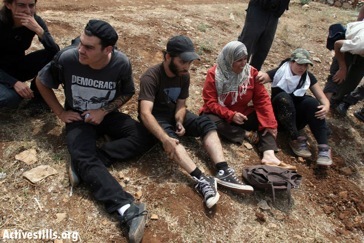 The village of Shufa presents an extreme example of the inhumanity of the occupation – not only are 1200 residents denied freedom of movement due to the nearby presence of an Israeli settlement (illegal under international law); they are also denied phone lines and electricity, despite the fact that electricity sources are located just 200 metres from the village. Currently the Shufa municipality operate a generator which provides just four hours of electricity each day – less if the price of diesel is high. Residents are intermittently granted extensions to these hours if there is a special occasion, such as a wedding. The village had phone lines and electricity until 2001, when, at the whim of the Israeli authorities, it was cut – ostensibly because the lines passed through Area C (Israeli-controlled territory according to Oslo agreements of 1994). Water access is also a major problem for the village, but Israeli authorities refuse to give them permission to build a new well. 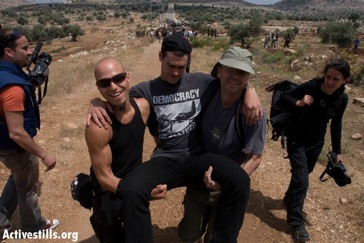 This situation exemplifies the system of apartheid that is now entrenched in the West Bank. 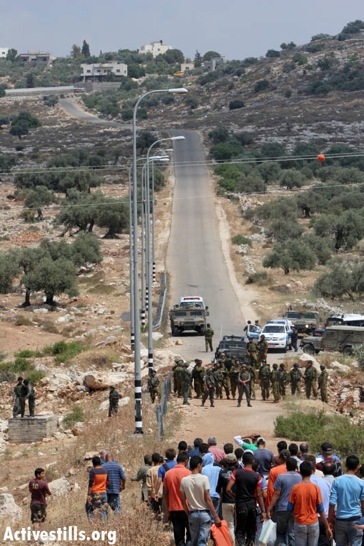 Palestinians cannot drive the one kilometre stretch between Izbit Shufa and Shufa, whilst a Israeli-only roads, leading to the settlement of Avne Hefez, known as a “weekender” or “holiday” settlement, surround the villages. 2500 dunums of Shufa’s land was stolen to construct the illegal settlement and the nearby military base, but a further 2500 dunums are unreachable because Israeli soldiers systematically prevent Palestinians from accessing them. Palestinians are regularly prevented from harvesting their crops, with settlers harvesting them instead. The Oslo agreement was particularly pernicious in implementing this system, with the village of Shufa being tightly bound by Area C, thus preventing the building of any new homes. Even the local council is unable to build a new council building, because the Area B land is not available. 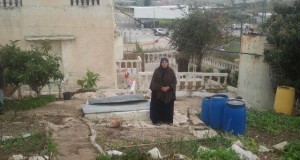 Building in Area C is impossible, despite the fact that the land is owned by residents of Shufa, because Israeli authorities systematically refuse to grant building permission to Palestinians.